(S0220) Since 1997, there has been at least one incarnation of the Stargate saga running on television that spawned from the original 1994 film. Much like the Star Trek series that came before it, Stargate ran on a similar formula about a group of explorers who would explore strange new worlds, seek out new life and new civilizations and boldly go where no man had gone before. But instead of using a spaceship, they use special gates that allow you to move through a wormhole from one world to another. In Stargate Universe, they decided to deviate from their standard formula, which ultimately brought about the demise of the show. Trying to be more like the recent Battlestar Galactica remake that ran for several years to critical acclaim, the show was a lot darker. The crew was a ragtag group of military, scientists, and civilians forced together on an alien spaceship, called the Destiny. They were trapped on the other side of the universe, forced to go along with wherever the computer run ship would take them. There was little to no hope of survival, and even less chance for them to ever return home. Not only was the tone a major contributor to the downfall, but it was also due to the lack of serialization. No longer was it possible to sit down and watch a self-contained episode, but instead you needed to watch multiple episodes in order to get resolution of the simplest plotline. The most evident of this was during the first season where it required three parts just so that the crew could find a fresh air supply. That also led to three more to get the lights and water replenished. Season Two was a little better, but still the final storyline about the ship being hunted by drone ships that are bent on the destruction of all technology has taken half the season to accomplish. The final issue facing the show was the lack of villains. The two villains in the show were an unknown and rarely seen alien race, and a group of drone spacecraft. The real adversary that the crew faced was survival. While finding food and supplies can be a difficult undertaking it doesn’t make for great television. If it was, then the reality show Survivor wouldn’t need to have challenges or vote people off. So what was the reason to watch? The reason was because of the characters. Every character was well thought out and absolutely fascinating to watch. They were nothing close to the stereotypical ones you might find in your typical sci-fi show. They were complex. They weren’t always good or bad. Simply put, they were real. Some of the best moments came from how they reacted to their situation. When Colonel Young (Louis Ferreira) abandoned Dr. Rush (Robert Carlyle) on a deserted planet because of his mutinous ways, or Rush and Eli (David Blue) tracking down a murderer for the simple fact of vengeance, and even when the Colonel had to smother one of his own men who was too injured to survive but would have slowly bled out and died. Those moments are what made it worth watching. The show was just beginning to hit its stride when it got cancelled. The second season finale was also the series finale. The finale episode left off where the last one ended. The Destiny was trapped. All along the path that the ship was heading, the drone ships had set up blockades around the planets containing stargates and around the suns and stars where Destiny could replenish its energy supply. The blockades were set up as far as the sensors could read, which was to the end of the galaxy. That left the crew two options. The first one, and most dangerous, was to blast their way through each of the blockades. It might work a few times, but they would keep taking damage and eventually it would catch up with them. The second choice was to plot a continuous three-year course in hyperspace that would take them out and around the blockades and eventually into the next galaxy. But there was not enough food, water or life support to last that long. So in order for them to survive, the entire crew would need to go into stasis and hope that no problems occurred during those three years or that their calculations would be correct. If even the slightest thing went wrong, they may never leave the stasis pods. While it would have been completely out of character for the show to end with a happy reunion back home on Earth, a certain amount of closure would have been preferable. But instead of a final battle or even a solution to their current dilemma, it ended with a whimper and not a bang. With most of the crew in the stasis pods, some pods not working, some people not able to get into the pods just yet, and no idea if the plan would work, it was over. And we will never know what happened to the crew of the Destiny. I very much enjoyed the original film, but the subsequent television series never quite hooked me. Your review does much to explain why, Todd. Though I am a huge fan of shows that slow down enough to let you hang with characters (The Wire, The Killing), there's got to be enough "there" there to keep you interested. I'm having the same struggle with watching Treme's second season on that exact score, for another example. In any event, great job with this Todd ! A very good review, it hit alot of nails right on the head. Only problem I had was that you said it ended with a whimper. While, yes, the ending wasn't the perferred one, they also got cut short. The second season had wrapped by the time SyFy made the decision not to renew. I'm sure had SyFy said to them, "Okay, we're not renewing, wrap it up. ", they would've had a better ending. I personally say, for an ending that wasn't meant to be and ending, it was pretty decent. @ Eric-I actually didn't like the original film the series was based on. It was okay, but there was something I just didn't care for. It was a great concept, but I just failed to connect with it. I liked all the various series much more. @ Ryan-You do raise a good point. There wasn't much time to create a great series finale, but I still felt it ended weakly. I wanted them to continue on their journey, but they weren't even given that. It was left in complete limbo. Eli is my favorite character and he grew up in the episode, so it was both good and bad the way it happened. I'm hoping that maybe SyFy will do like they did with SG-1 and make a movie. I cannot disagree with your review more strongly than to say - that Universe was the show that the others should have been. I enjoyed from the kick-off with RDA, but it was a little too whimsical at times and lacked depth and gravity, O'Neill was supposed to have a dark past, yet most of the time he played the clown, which might have been a giggle the first couple of times, but it made the thought of a special ops soldier too flimsy since he was never able to take that dark decision one might have expected. Atlantis, entertaining, again I adored watching mostly for Rodney McKay perhaps one of the best creations. 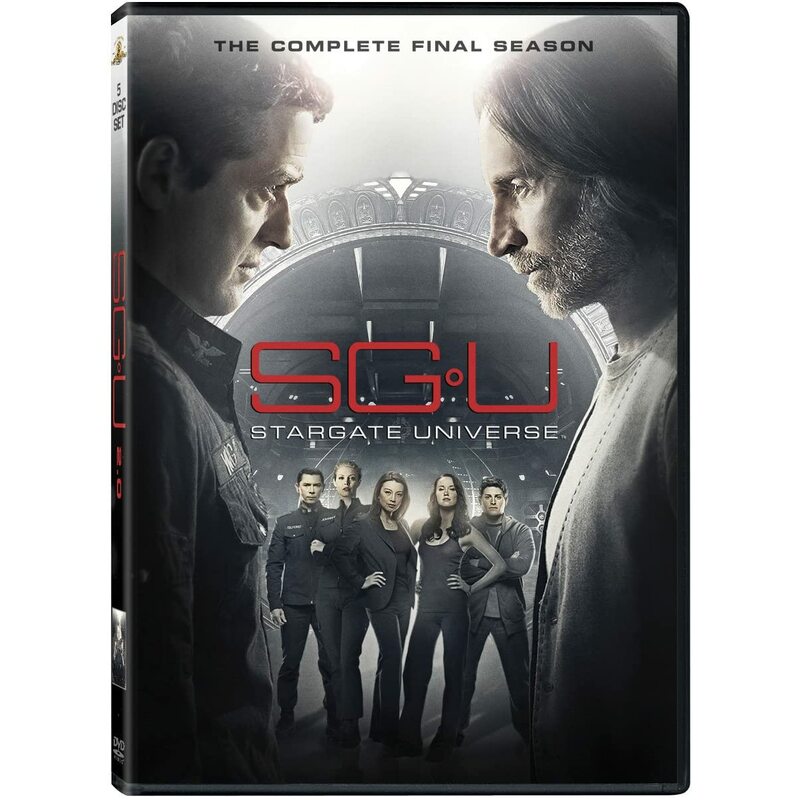 SGU had everything that its predecessors lacked, it had grit, determination and style. There were no witty little light endings, everything was reality in as much as scifi fantasy based shows can be. Murder, mayhem, arrogance and despair were brilliantly portrayed. I think the show being cancelled led to a conclusion that whilst not ideal, made sense because it gave the opportunity for a relaunch - maybe even a TV Movie. The premise was sound, many of the fans decided to mutiny because of Atlantis being cancelled allegedly in favour of this show. Which was a shame. Dr Rush was perhaps the most intriguing of the show. Eli? I wanted to put him in a shuttle and send his over the horizon never to be seen again! So much potential cut off again by the usual lack of advertising no doubt. What a shame our society is so driven by money. Shakespear would never have gotten anywhere if that's all he cared about! Since ever I wasn’t that deep into SG-1 or SGA although these are entertaining shows as well i don’t like the concept of a story arc in one, two or three episodes. Simply mounting tension 43 minutes and solving the whole thing in 2 right before dinner makes the episode scenario somehow unbelievable. Even at the risk getting some SG fans angry but Carter is an insanely unbelievable character decrypting any 100 million years ahead technology secret of the universe in no time. Jackson can speak masterly all languages of the universe even those he never heard of. What Carter is for astrophysicists is Dr. McKay for the IT department and no he's not funny all the time even if he tries to. When i watch such things i can get entertained by the show anyway but my intellect switches into couch potato mode not really fevering with the characters as i know in the first two minutes that they are in the show to save the day and in the end everyones happy, holding hands and singing songs. After 10 seasons of SG-1 one and further 5 seasons SGA with the nearly same storytelling that gets sometime really boooring. I think what most SG fans didn't understand that you can't bang, boom and explode through space without a really good believable reason and with getting used to the people involved and knowing them and their motives. SGU made things different and i know that not every SG fan agrees to that concept but i love it. A darker more realistic approach. More believable. People on the destiny trying hardly to survive and they aren’t superheroes they can’t even steer the ship in the beginning. Sometimes i had to opress a tear beginning to feel for the characters and the things happening to them and i'm not the kind'a'guy who cries easily, usually. People on the destiny are in need of air, of water, clothes, they need food and when i imagine myself in that situation that would be the thing i would really care of first. Medic Tamara can’t do complex surgery. Greer who thrusting nobody on the ship in the beginning except his commander. The nerd Eli who can be seen literally growing into his role. Young despairing of the ship’s command and the decisions he had to make. Chloe afraid of becoming an alien. The scientist Dr. Rush which is a deep multi dimensional character who always seems to hide his real intentions. Destiny’s mysterious chair which reveals information only at a price. It's this piece by piece puzzle which makes events of action believable getting a bang, boom and exploding through space on top of that is the cherry on top of a great cake and heck yea SGU is a great cake! It seems you're among a tiny minority when it comes to appreciation of the finale. Feedback from fans and critics alike has been overwhelmingly positive thus far. This was a good ending, if it truly is the end. SGU was awesome. I can't believe it's gone now. I too liked the show and saw every episode, and I still stand by my review. From the begining I could see that it wouldn't last long. By changing the basic formula it lost a lot of viewers from the first two series. And then when storylines cover multiple episodes it makes it difficult to bring in new viewers because you can't just jump in anywhere and follow along. And unfortunately, It's all about the ratings. That's what's beautiful to me, that we all as tv fans/enthusiasts/geeks can come together to discuss, hash out, and occasionally passionately argue about the shows we feel strongly about one way or the other. Ok, the ratings stunk, but frankly I'm tired to getting involved with a series then have it suddenly cancelled with no resolution. I was not a big fan of Atlantis and SGU well, even less a favorite. But the final episodes were better and Eli didn't deserve being left the sole awake being on what seems to be the Flying Dutchman of the universe. SyFy should at the very least give us a two hour or even four hour-2 part movie to resolve the fate of the Destiny. Also, the Eli character doesn't deserve this fate. After all, how much $ could it cost SyFy considering what they put in, shall we say, less than notible stand alone made for SyFy movies. When it comes to the 3 Stargate series, SGU was the one to watch, IMO. To think that SG1 lasted 10 season and SGU was axed long before S2 had finished airing was a miscarriage of TV justice. As far as the finale is concerned, I was very satisfied with it (other than the fact that it WAS the finale). SGU only got to tell part of its story, so anyone expecting resolution was asking for too much. The final few minutes were gorgeous and offered about all it could for disappointed fans...hope for the future.